Two people were killed and fourteen others injured this morning when a taxi crashed into the side of a truck on the Viljoenskroon Road, approximately 10km outside of Potchefstroom. ER24 paramedics, along with other services, arrived on the scene shortly after 01h00 to find both the truck and taxi on the side of the road. Several passengers from the taxi were found walking around on the scene. Upon closer inspection, paramedics found the bodies of the male taxi driver and female passenger lying trapped inside the taxi. Unfortunately, both patients had already succumbed to their numerous injuries. Nothing could be done for them and they were declared dead at the scene. Fourteen other patients were found at the scene. Three had sustained critical injuries while eleven others had sustained injuries ranging from minor to moderate. 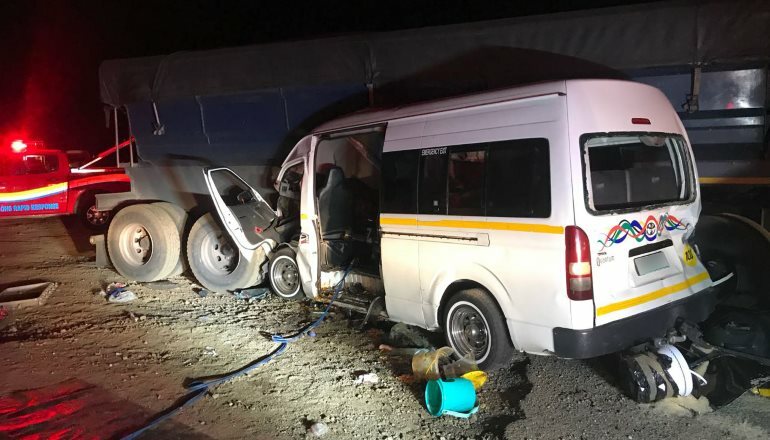 One of the critically injured patients, a woman, was found lying trapped inside the rear of the taxi. Rescue services had to use specialised rescue tools to free the woman from the vehicle, an operation lasting an hour. Once freed, paramedics treated the patients and provided the three critically injured with advanced life support interventions. One of the critically injured patients was airlifted by a private medical helicopter to Lenmed Randfontein while the remaining patients were transported by ambulance to Potchefstroom Provincial Hospital for further care.